Thought pizza should only be a weekend treat? Think again! 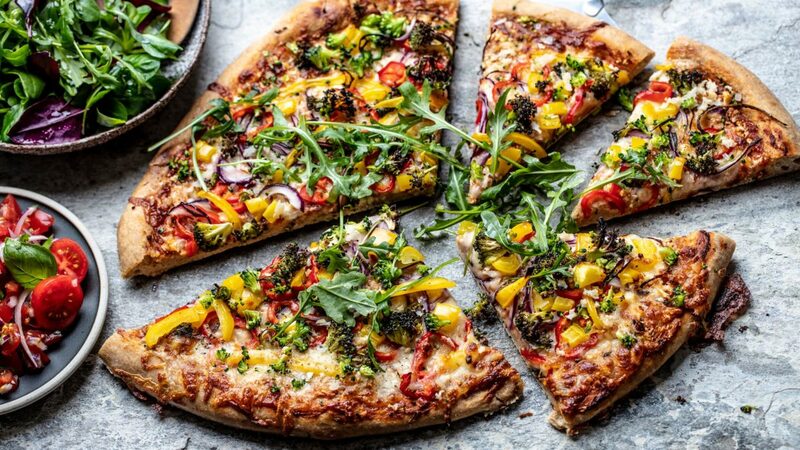 This delicious plantbased pizza with a wholemeal base and a rainbow of vegetables is healthy for both you and the planet. This is the 1st recipe in EAT’s one week dinner menu. It is made by Norwegian chef Lise Finckenhagen and aligns with EAT-Lancet’s Planetary Health Diet. To find the dinner recipes for the other days of the week click here. Crumble the yeast into a baking bowl, pour over water and stir until the yeast has dissolved. Add the plain and wholemeal flour and quickly work the mixture into a dough. Add the olive oil and salt and knead the dough for 10-15 minutes, until it is smooth and elastic (kneading at full speed for the last few minutes). Cover the baking bowl with cling film and put a tea towel over the top. Leave the dough to rise until it has doubled in volume. Peel and cut the onion and pepper into thin slices. Break the broccoli into small florets and shred the cauliflower. Heat the oven to 220 degrees. Fold the dough together and divide into two equal-size portions. Roll each portion out into two pizza bases, transfer them to a baking tray covered with greaseproof paper. Spread the bases with tomato sauce and sprinkle with the cheese and cauliflower. Add the onion, pepper and broccoli. Drizzle with olive oil and sprinkle with a few flakes of salt. Bake the pizza on the middle shelf until the vegetables are soft, the surface is golden and the base is baked. This should take about 20-25 minutes. Have fun with your pizza and add the veggies you love! This delicious dish is perfect for family gatherings! Read article "Day 2: Baked Cod with Creamy Pesto"
It will only take you 30 minutes to make this flavorful broth with chicken and noodles. Read article "Day 3: Easy Chicken Ramen Soup"
A cheap and comforting barley-otto with roasted root veggies for winter evenings. Read article "Day 4: Creamy & Wholesome “Risotto”"
This plantbased veggie tacos with tomato salsa and guac is the perfect start to the weekend! Read article "Day 5: Veggie Taco with a Twist"
Colorful, healthy and delicious falafels! What more can you ask for? Read article "Day 6: Simple Falafel Wrap with Hummus"
This tasty chilli and cauliflower recipe is healthy and filling, perfect for the whole family! 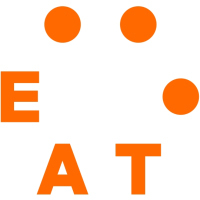 Read article "Day 7: Cauliflower Chili Con Carne"
EAT's founder & executive chair Dr. Gunhild Stordalen reflects on the groundbreaking journey that lead to the launch of EAT-Lancet Commission. Read article "E0: The Big Picture"
Prof. Walter Willett and Prof. Johan Rockström take you through the key findings of the EAT-Lancet report. Read article "E1: The Planetary Health Diet"
Are you ready for the #planetaryhealthchallenge? Join us as we try out the most delicious recipes to benefit both people and planet. Read article "The Planetary Health Challenge"